The concept of “4 stages of learning” or the “4 stages of competence” was a learning model introduced by Noel Burch. It describes psychological states that are involved in going from incompetence to mastery when learning a skill. It states that when learning a skill humans are incompetent and as the learning progresses the skills are mastered and can be used without using conscious contemplation. Let’s have a look at the 4 stages. When the person starts learning a skill, he is in the stage of unconscious incompetence. He lacks knowledge, skill, and capacity to do the job competently. In this stage, a person doesn’t even realize he is doing the things the wrong way. He can be in this stage for long unless told the truth by experts. The second stage starts when you start realizing that there are things you do not know about. You try to make efforts to learn the new skill well. You realize you would need to work hard to improve yourself. This is the stage where you can feel embarrassed about the incompetence. You can decide to make the change and make all the efforts to learn something in a better way. In this stage, the individual starts moving towards complete competency, the mastery. You understand how exactly to do things. To be consciously competent you dedicate yourself in the improvement of the craft. You start improving by repeated practice. The task is broken down into steps and mastering the steps gives you conscious competence. Formal training undertaken in this stage puts you on the track to the next stage. After practicing a skill innumerable times in the previous stage, the individual reaches this stage where the skill becomes a second nature. It can be performed with the utmost competence without putting too much thought into it. One gains a mastery over the skill and is considered to be good at it. 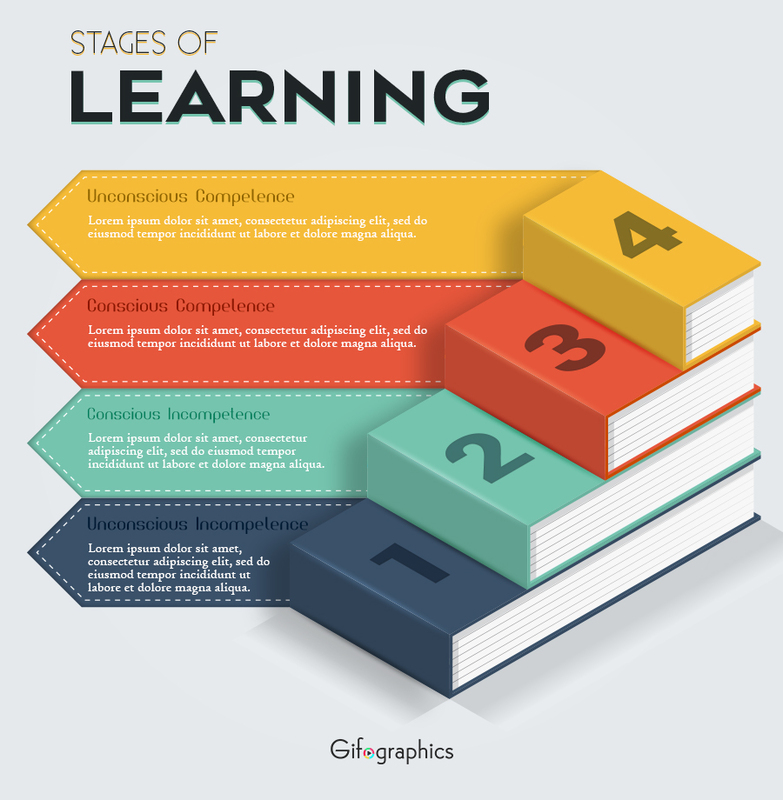 This infographic given below depicts these 4 stages of learning. You can download it and edit it to include descriptions of the 4 stages of learning. You can use the template for free. Gifographics.co brings you a wide collection of infographics designed by experts for free download. Using infographic templates allows you time for other important tasks. By understanding the four stages of learning a skill, we can concentrate on the learning process itself and not feel bad about where we’re at, and why we don’t know everything already.